In fine black ink lines and thin washes of color, I’m illustrating the classic Vampire tale Dracula. I tried to start The Christmas Carol but I had some sort of mental block. But Dracula is fun and weird and full of Vampires who aren’t like me. I don’t have to drag a coffin full of dirt around me. I’m a mom so my big mom purse is big enough. My kids make jokes that it is full of river rocks. I can’t imagine a coffin surrounded by dirt much less a coffin. It would be fun to have a crazy guy at my beck and call to do my bidding (read the book you’ll know who I’m talking about.) Oh right, I have a husband. HA HA HA. When Dracula came out we all read it. I loved the format in letters and diary entries. We laughed and then we went back to our world of darkness and love and the fine art of sharing blood and bring the friendly predators we are. My first copy of Dracula was given to me by Lola, my great great great grandmother. She called it quaint but said I’d better read it because it would have a huge impact on culture and our lives. Fiction often does that. There are so many examples: Sherlock Holmes, The Lord of the Rings, Frankenstein, Animal Farm, Travels with Charley, Anna Karenina. The list is extensive. But we’re Vampires so Dracula was a big thing for us. This blog is about Vampires – Modern Vampires. So you’re in the right place. I muse too. Want musings? You’re in the right place. Lola is old and conniving and can charm the soul out of man unlike any other Vampire I’ve here met. She was born the same year as Jeffery Chaucer but can pass for 25. Except in her eyes that are as cold and deep as the Arctic Sea. I like using flowery descriptions when I talk about Lola. It fits her. She breaks all rules of good taste and correctness so when I write about her I’ll break all the rules too. She tells me I need to draw more. Something that used to come so easy is hard for me now. Some clarification – I draw everyday. I just don’t draw my own art for my own pleasure. By the way, I hate playing Pictionary. No. I’m done with parlor games that don’t contain trivia or aren’t played on the Wii. At the very core of my dark heart and cold soul I am an artist. It is always how I’ve identified myself to myself. That isn’t dependent on how much I draw or paint. How we see ourselves doesn’t depend on how we’re seen by the general public or anyone else. To your core you know who you are and what you are. I live around teens. Some of them already know who they are. Some are still growing into their identities. They’re good kids – smart kids. They’ll find their identities. Sure they’ll change and mature as the years pass (as the centuries pass for some) but they’ll always know who they are. You can live up to the expectations of others and do well. But you need to also live up to your own expectations. Living up to your own expectations is always much more difficult than living up to the expectations of others. It can be painfully difficult, but the rewards are infinitely greater. So do your own art, whatever that is. Lola and I are off to the museum to see a new show of someone she knew in the 1870’s. This entry was posted in art, Being Yourself, Creativity, Drawing, Musings, Parenting, Teens, Vampires and tagged art, being an artist, Being oneself, blogging, Dracula, drawing, Finding your own self, finding yourself, illustrating, musings, parenting, teens, vampires. Bookmark the permalink. I adore your Poe illustration. Awww. I’m so glad. Thank you. We should all take a lesson from cats. They don’t care. They just are. And it always works. I very much like your Poe illustration. 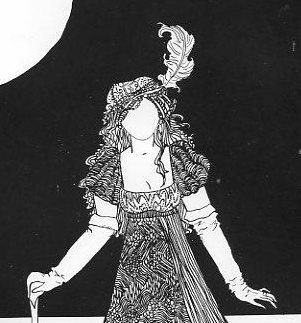 Brings Beardsley to mind but without his occasional languid sappiness. It’s a great look for gothic illustrations. I’d be very curious to see what you do with Dracula. When I first read it, I was 16, living in Europe (my father worked for IBM and was assigned to the lab in Nice for two years). My room was apart from all the other bedrooms and had French doors opening onto a porch with a latch you could flip open with a butter knife. So I decided to read Bram Stoker late at night, in my isolated room, after everyone else went to bed. Brilliant. Let’s just say I was glad we had lots of garlic in the fridge because for the duration I was unable to get to sleep without rubbing a clove around the door frame. I have an unfortunate habit of reading interesting tidbits online and not referencing them, so I can’t give a reference for one involving an incident in New England that made headlines in New York where Stoker was visiting shortly before he wrote Dracula. Apparently there were several waves of vampire scares in 19th c. New England, and in this case, some poor girl’s body was exhumed and mutilated when she was the last of her siblings to die of a “strange wasting disease” which we now, of course, recognize as tuberculosis. Apparently archeologists still come across such burials. But I digress. I hope you’ll continue to post illustrations you make!